Response: After Initiate of Huang Hun enters play, each player returns a character he control to its owner's hand if able. 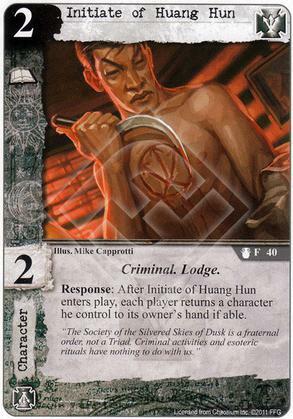 Flavor Text: "The Society of the Silvered Skies of Dusk is a fraternal order, not a Triad. Criminal activites and esoteric rituals have nothing to do with us." Hi! "able" is misspelled as "abel". Is there any way to correct this? Fixed, you can always PM me if I don't see it quickly. Can anyone postulate on why this guy was removed from the restricted list? More cheap characters available, along with enter or leave play effects, means he may not do enough for you any more. Should be noted that he is now loyal, which would also explain the unrestricting. I think I'm just going to start playing the cards the way they're printed. I don't want to be bothered keeping up with all of the changes on these cards because it slows the game down too much for me. Restricted and Banned is one thing. Changing the card so that it's no longer Restricted is just nonsense. Yeah, no. I'm thankful that I can play Nug, Descendant of Eibon and folks without feeling bad since their original card texts are just over the top. Sure, it's bothersome, but I'm thankful for a larger card-pool provided by reasonable erratas instead of just have more cards Restricted or Banned (i.e. put on the "can't be played" list). Also, it's not like you have to carry around the errata for all the cards all the time. Sure, someone at a tournament is going to want to have the most up to date errata available, but if you are just playing at a friends house or some casual gaming at a local store, then all you need to know is the errata for the cards in your deck, which is most likely, at the most, going to be one maybe two cards. Personally I like the idea that this is now loyal, restrictions breed creativity, and now I am being creative in trying to build a deck in which this card is key, which means I'm leaning towards mono ST which is something I never would have had a reason to try before. I don't get why it's so bad to say "If you have the Initiate of Huang Hun in your deck, you can't have Diseased Sewer Rats too." That's straight-forward. That's simple. You can just go on Deck Builder, and it will tell you that your deck has a Restricted problem. Why is it better to nerf a card like Initiate just so you can use it however you want? Why nerf the card when the problem isn't the card but rather how players are using the card? If a card is just misprinted or just flat-out broken, that's one thing. Sorry to say so, but to nerf a card just so it can be played however you want sounds kind of infantile to me. Personally, I like there being a pool of powerful (Restricted) cards. There are clear rules in terms of how these powerful cards can be included in a deck, but I still have access to them. I'd rather have limited access to powerful cards than unlimited access to mediocre cards. Then the choice of which Restricted cards to use is in the hands of the deck builders, not the game designers. I can't get behind this mindset of "Take away my powerful cards, so I can make whatever decks I want with the garbage that's left over." Why nerf the card when the problem isn't the card but rather how players are using the card? Bad cards (as in overpowered) aren't the players problem (or shouldn't be), but the games' or design's problem, really. It's not like I made or make the card text up. A good card doesn't even allow me to abuse it. Sorry to say so, but to nerf a card just so it can be played however you want sounds kind of infantile to me. Sorry to say so, but this whole sentence sounds more childish than what you're criticizing as a whole. How is this valid - FFG-made, btw - choice on how to improve on the game "infantile", what does it even have to do with childish notions? Nobody said "however I want", quite the contrary in fact, Zinquox for instance explicitly stated that he likes the restriction the Initiate's Loyal imposes, so please don't straw-man. Side-note: You're the one saying "I'm gonna make my own rules and play the texts as written on the physical cards instead of how the designers plan it! ", not I or anyone else. That's not the grown-up attitude I'd expect from someone accusing others of being infantile. Anyway, as for the Restricted-section: To me, it's a crutch, nothing more, nothing less. Opinion: in a perfectly balanced CoC world, there shouldn't be any restricted cards. It could have been planned all along at the games' inception, they could have marked the cards etc., but it's obviously (and admittedly) an afterthought. It's indeed kinda laudable, that FFG turned this balancing shortcoming into some *kind* of strength, I mean, they could just have outright banned those cards and be done with it. Instead they chose to keep the larger card pool while acknowledging that some cards are quite a few notches superior to others (and it is indeed a nice way to build a deck, picking a restricted card and going from there). That's great, really, but the system really shows its problems when it comes to restricted options like the Yithians or Meiger/Rite of the Silver Gate: Neither a single Yithian card nor Meiger or Rite of the Silver Gate really warrant a restricted status, it's only when it comes to comboing specific restricted cards that stuff gets nasty. Now what we're left with is, thanks to the restricted-rule, a world where neither Meiger, nor "his" Rite, nor most of the Yithians are ever considered for the restricted "slot" of a deck, because they simply are not worthy of it on their own. So, it really is just a mediocre crutch that prevents broken stuff, but isn't particularly well thought out in the end since it also prevents some decks that are totally harmless. If you're fine with having those card practically banned and having your deckbuilding more channeled, more power to you, but I see no inherent good in limitations when it comes to deckbuilding. They *can* be fine, but are prone to being detrimental (quite obviously, at that, the more cards are restricted/banned, the fewer choices there are to make). That's nobody's mindset but your straw-man's, really. The hyperbole doesn't exactly add to the argument either. Fair enough. I'm sorry if I caused any offense. I understand the points you're making. We'll just have to agree to disagree.